The Caribbean is world famous for the kind of outrageous fun had by kids when the teacher leaves the room. Its blend of azure water, glistening islands, excellent food, casual atmosphere and constant breezes with line of sight navigation for sailors attracts visitors like lemmings. In essence you would have to work really hard not to have a good time in this island paradise. Some attribute this draw to the fact that in this part of the world it is the mixer that is the expensive part of the cocktail, and therefore the part that the barkeep is stingy with. After dozens of visits there myself I think it is really simpler than that. The minute you step off the plane you can sense in the air that you have landed in the epicenter of fun. Each island has its own contribution to make to the mix and I would like to offer some of my favorite “tings”. I usually fly to Tortola, in the British Virgin Islands commonly called the BVI. It used to be a funny little tin roofed airport building which had walls only most of the way around it, and turquoise water right up to the tarmac around most of the runway. Welcome to Beef Island. One time I rolled my luggage from the under the roof across the runway and onto a small dock, hopped into a skiff and climbed aboard a 63’ sailboat which was gently swaying in the wash of the jets coming and going overhead. 10 minutes later we were under sail in the golden hour before sunset with fresh fruit rum drinks and 75 degree breezes over the deck. It doesn’t get much better than that. They have modernized (notice that I didn’t say improved) the airport building since then, but the little dock to the harbor is still there. Another clue to the nature of the British Virgin Islands can be found in the airport and on each of the islands. When you first enter the BVI unless you hold a British passport you must do what is known locally as “clearing in”. Passport in hand you see two signs; one for “visitors” and one for “belongers”. Some of us visit these islands to enjoy a very special attitude about life and the living of it in an environment tailor made for celebration. Still it is never quite forgotten that the “belongers” invented it. The signs have been changed in the recent past, but the distinctions remain. Being a sailor I have visited most of these islands by boat. Whether you come by skiff, bareboat charter or in the rarified luxury of a superyacht this is clearly a boat person’s paradise. In my mind afloat is the best way to get to know the region. In case of emergency (as in you can’t get your own boat) there are ferries and small shuttles to get around but one of the things that I love about the BVI is that there is nowhere for a Cruise ship to park. Arabella, cabin charter at it’s finest. One of the finest ways that I know to see many islands in a week enjoying the boat life is by boarding the lovely Arabella. 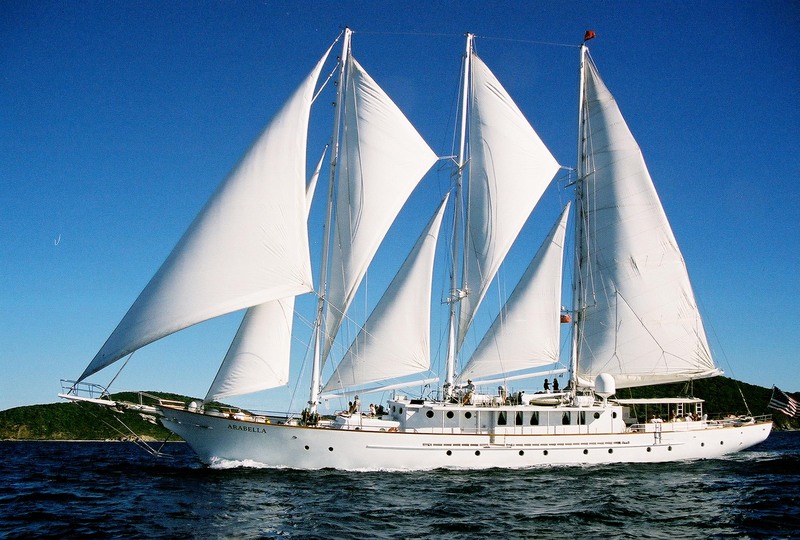 This 156’ four masted schooner has 20 staterooms and is a wonderful introduction to a half dozen islands while seeing many of the famous beaches, snorkeling spots, sampling restaurants and relaxing at beach bars. No sailing skills required. For those who prefer life “on the hard” each island has its own style, some are large, busy and bustling with places to enjoy every kind of tropical adventure. The largest of these is Tortola with something for everyone! The smallest might be Sandy Spit, which is probably the island that cartoonists are thinking of when they draw the guy alone under a single Palm tree surrounded by endless horizon. It might be 200 feet long and 100 feet wide and a few inches larger at low tide. It supports one palm tree and several dozen scrub bushes surrounded by wide white beach of the kind you dream about during the gales of November. But it pays to remember that you could be alone there so bring your own “fixings”! If you would rather be served than brown bag it, the BVI has way more variety in food and drink than anyone could guess would be packed into a few dozen islands. 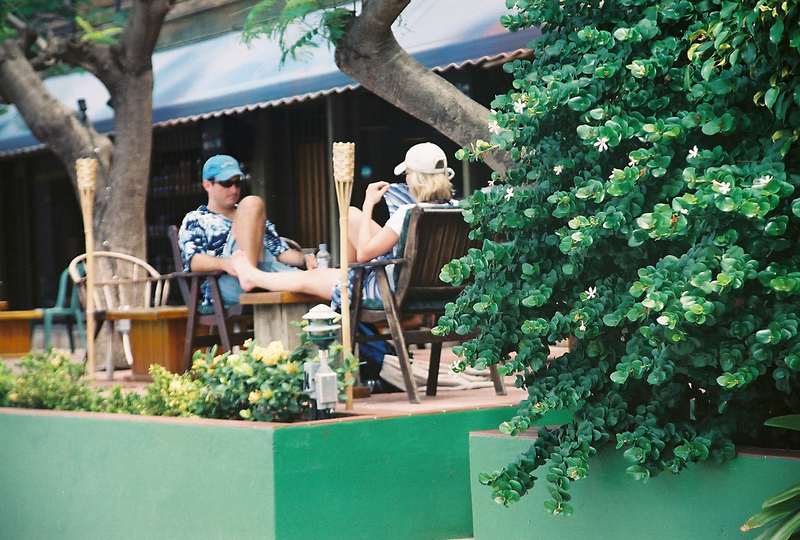 Fruit, fish, spices and veggies are fresh and abundant all through the islands, and creativity has no bounds. Among my favorites are sweet potato encrusted red snapper served on banana leaves, Callaloo lobster, Conch fritters cooked over a 50 gallon oil drum and you should try every roti that you come upon, dipped into some kind of fresh fruit chutney. You will miss it when you go home! Some of the best food in the islands comes from the most unlikely looking places, casual beach bars are always good at any time of day. If your mission was to go from bar to bar up the Sir Francis Drake Passage your liver would be waving a little white flag before you got around your second island. The islands are justly famous for taking reality in very small doses and locally made high octane in large ones. And remember the bit about the cost of mixers? Since some selectivity is required just to get by, these are a few of my favorites. 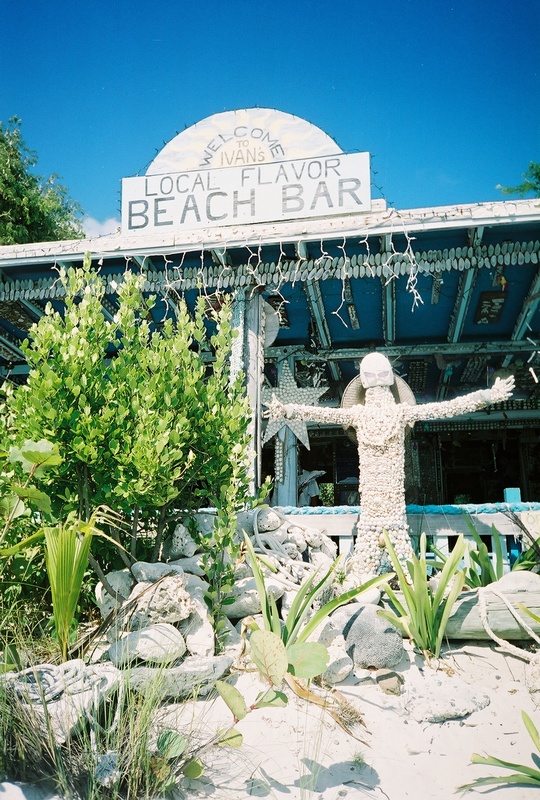 I walked up from the water of Little Harbor on Jost Van Dyke, past the shell encrusted “savior of the sea” and into Ivan’s No Stress Bar. No stress indeed, no bartender either. The note on the counter said “make your drink, start your tab, pay it when you leave.” That’s right, this was the famous honor bar, a place that never closes because time has no meaning. You really will lose any stress that survived the trip to Jost sitting with your feet in the sand watching the boats rock gently at anchor surrounded by nothing but perfect beach and gentle waves. 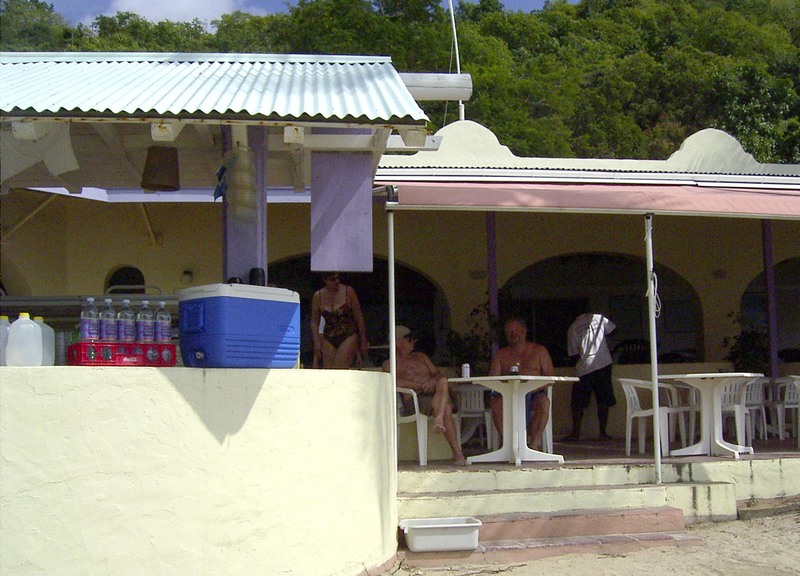 Jost Van Dyke has only about 200 residents but it is a very good place for a visit. While you are there you should walk over the hill to the beach that they call Great Harbor. 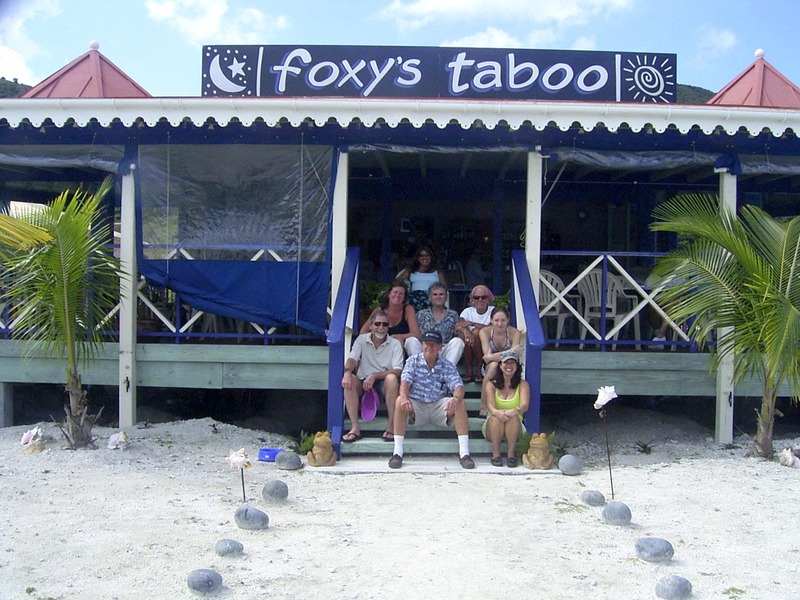 Foxy’s is probably the most famous of all the beach bars in the region, famous for food, famous for music and famous for Foxy himself. Of all the places in the BVI this is the legendary place to spend new years eve, which by default means new years day as well. Get ready for the wooden boat regatta held then, anything made of wood that still floats will qualify you for one of the really crazy events that kick off the year. 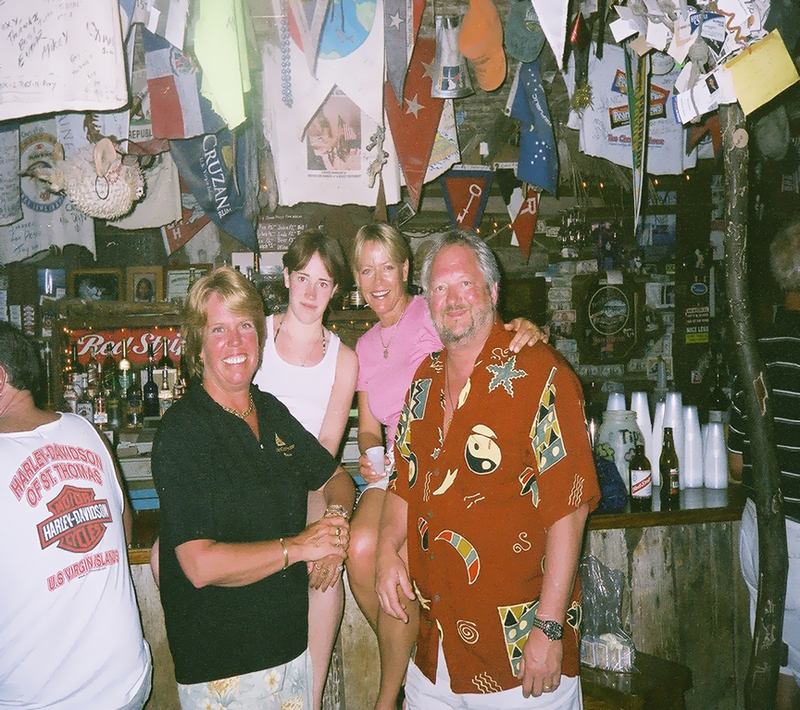 Another time I happened to arrive on Tortola at the full moon, which means exactly one thing to the island wise – Bomba Shack. 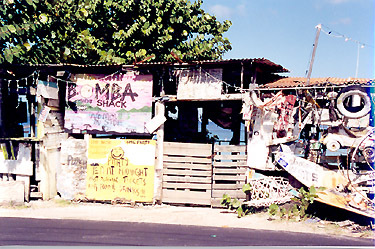 Perched between the narrow road and the wide beach on Apple Bay is a ramshackle collection of corrugated tin strips, sea washed beach timber, old bicycle frames and hand painted signs. The first one I noticed said “if you want a Bomba t-shirt, get naked and give him your underwear”. That is when I noticed that every inch of every rafter had sun bleached underwear wafting in the dark night breeze. Bomba must go through a lot of t-shirts! Still, mushroom tea is legal, the live music was great, the beer was icy cold while the sand was still warm, the full moon glittered over a luminescent sea although so far I have never seen one of these t-shirts handed over. If end of the universe tranquility is on your search list, it is pretty hard to beat The Cooper Island Beach Club. Sitting on the sand under the rustling palm fronds has inspired many a pin striped wage slave to run away from home. “The Cooper Island Dream” is made of peach schnapps, coconut rum, fresh fruit juice and peaceful fantasies of never hearing a phone ring again. Cooper Island has few people living there, 2 rental villas, fabulous diving, poison apple trees and is reputed to be the inspiration for Jimmy Buffet’s song “Cheese Burger in Paradise”. You can only get here by boat or ferry from Road Town, Tortola. The only thing on Prickly Pear Island in North Sound is the Sand Box. This is another spot where your toes are in the sand, your face is in the glorious sunset over “the dogs” and “Sunset Coolers” are served in goldfish bowls to the sound of sails coming down 50 feet away as beautiful yachts head for evening shelter at the Bitter End Yacht Club on nearby Virgin Gorda. This is one of the world’s most famous sailor’s Mecca’s and the parade of glorious yachts in the evening is well worth the dinghy ride. Virgin Gorda is on the other side of the channel. The Bitter End is a family run all inclusive fantasy camp for sailors offering over 100 boats of all sizes for the guests to play with. Guests stay in cottages dotted along the sunset side of the hill, with several restaurants, gift shops, excellent hiking along the ridge and excursions of all types. One of them is to The Baths at the other end of the island. 50’ tall smooth round boulders are jumbled along the point of the island with caves and paths through them and a beach on either end. The Baths is a truly amazing natural formation that no island tour is complete without. 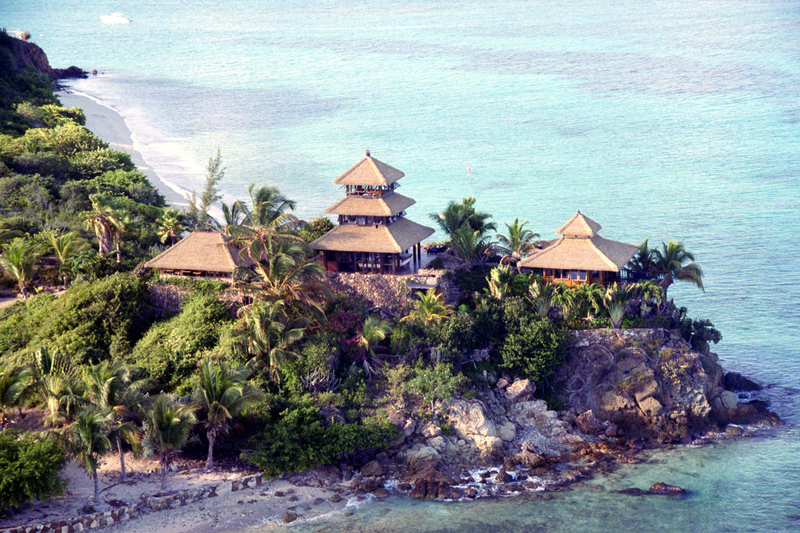 Just around the corner from there is glorious Necker Island. On top of the cliffs is one of the most beautiful buildings in the BVI, a Balinese design constructed for the pleasure of about a dozen guests. Staying there is one of the sweetest adventures that I have ever had in these islands. Might be because it came from the imagination of Richard Branson, himself famous for excellent parties, incredible food, beautiful uncontrived surroundings and a luscious joy of life. It is actually difficult to get there as you can’t get a room, you have to rent the whole 57 acre island and it is usually booked by famous people in search of paradise and the outrageously elegant and yet refreshingly simple life offered there. Well, that and the fact that just about anything that a guest can desire will be provided and all secrets will be kept. 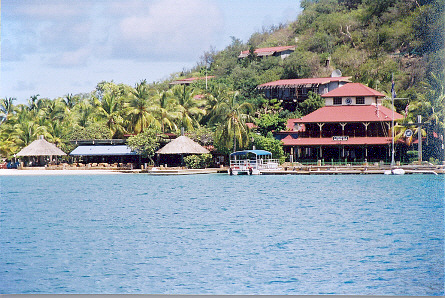 Peter Island is a private resort, but much more accessible to visit. At 1800 acres the island offers 20 coves for private exploring with sugary beaches accessed by kayak, windsurfer or sailboat. Tennis, volleyball, diving along with luxurious accommodations and a full service spa are part of your stay. If you are not interested in a private island, or an island that you share only with other guests, there are still many choices in the BVI. I love Lambert Bay on Tortola. Small cottages are separated from the ocean only by a line of tall elegant palms that are lit at the top at night, two restaurants and a tavern on the sand as well as a swim up bar in the pool make this sunset facing cove pretty complete. You feel alone in the universe as you look out to sea without another building in sight, and yet a 15 minute taxi ride will get you into the heart of the romp and frolic that Tortola has to offer. 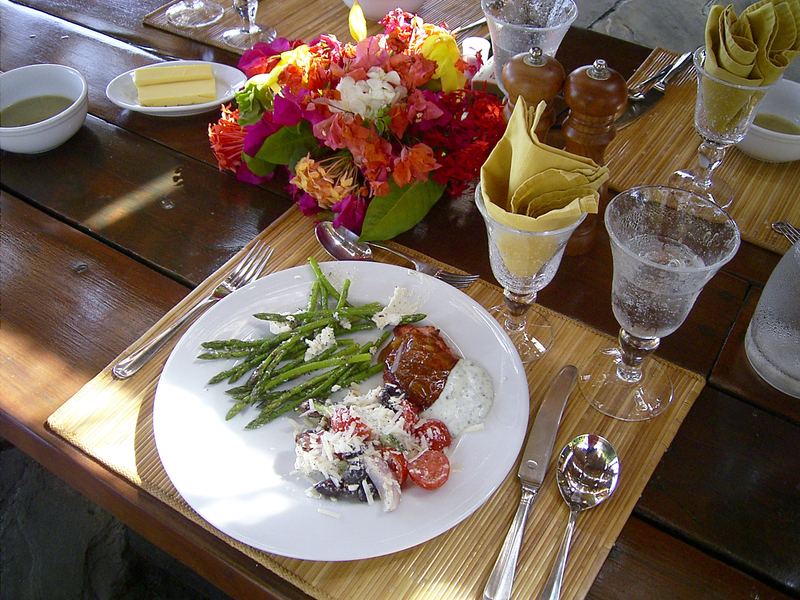 The manager told me a wonderful story about an elegant dinner party that they had at one of the beach side restaurants at Lambert Bay. Evidently the guests were very dressed up, and seated along the edge of the open air restaurant facing the sea when the newly installed lights among the palm trees came on. It created a lush dreamy effect high up in the palm fronds just as he hoped. Slowly he began to notice guests bending over from the tables, dozens of them looking at the floor. Evidently this was the full moon night of the turtle hatch, and the babies seeing the brightness in the trees came into the dining area in stead of heading for the moon over the water. The whole party became about scooping up the tiny, minutes old babies and then wading into the water in their evening clothes to release them. Now they are careful not to turn on the lights during the hatch, but it created a legend all over the island about this magical dinner. Many of the islands are uninhabited, or sparsely populated but almost every one has a place worth putting on a mask and snorkel, and some are even tank for shallow water diving. If this is what you are after find your way to Cooper island Cistern Point or The Devil’s Kitchen at the end of Manchioneel Bay. 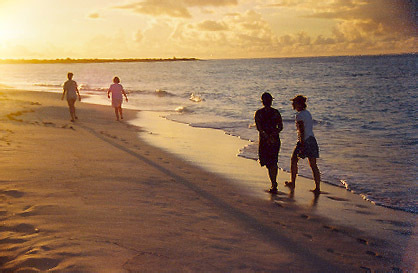 Sail Caribbean Divers on shore will be glad to outfit you and offer maps and even guides. Next door, Ginger Island has a site that will make you feel as if you left the known planet called Alice in Wonderland, named after the huge colored sea fans that make you feel so small. They can also take you over to Salt Island which is inhabited by one man who still harvests salt the way they did for hundreds of years, and out to the Wreck of the Rhone. Here is a ship that sank in 20-80 feet of water in 1867. The iron ship is now completely covered in choral, although clearly recognizable as a graceful sailing vessel lying on the ocean floor. 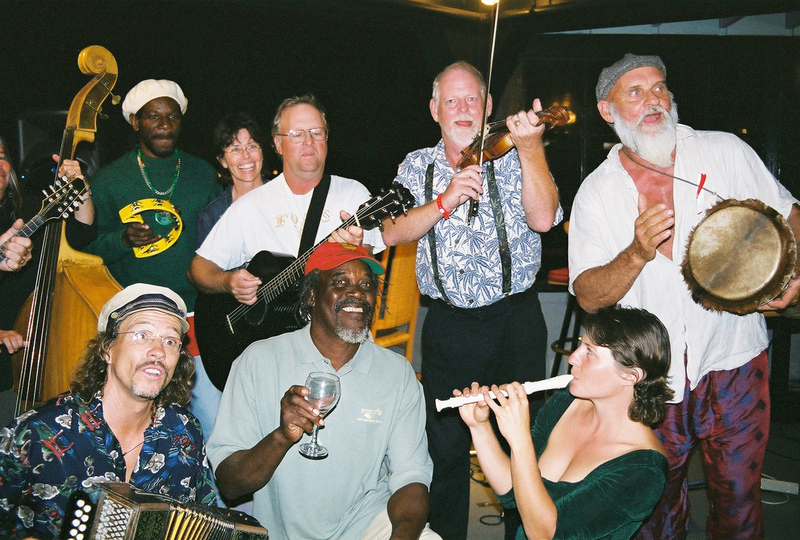 Certainly there is good entertainment above the water, in fact the BVI is a fisherman’s paradise. Bone fishing for the guy who likes to match wits with the invisible shallow water speed demons, and Wahoo, Yellow or Black Tuna or even Marlin for those that like to match muscle with the big guys. You really haven’t lived until you have gone after some of these guys with medium to light tackle though! Anagada, way up at the end of the chain is probably most famous for Bonefish, Permit and tarpon caught on a fly rod. Garfield’s Guides will be happy to show you the best spots if you make your way there. And don’t miss the enormous Anagada Lobster, but don’t go after those with a fly rod! 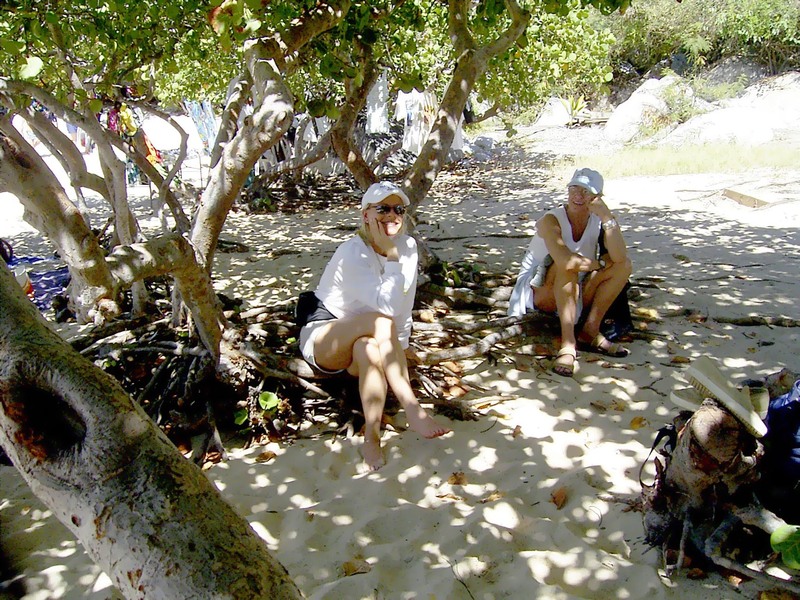 The BVI almost defines paradise and is worth taking your time to wander through. If you want to sail yourself you can do an internet search under “bare boat charters BVI” and find hundreds of places to get boats. Ferries are pretty reliable given an understanding of “island time” and of course you can fly into Tortola or St. Thomas to get them. Bring a sense of adventure and be ready to play. The BVI is kindergarten without the teachers, fun at every turn. With any luck at all we might meet at the golden hour with something icy in our hands and our feet warm in the sand!